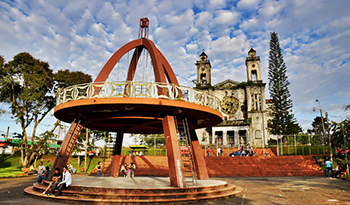 Puriscal: A friendly neighborhood near the capital. Foreigners are drawn to the friendly and peaceful city of Puriscal because of its close location to both the capital of San Jose and the pacific coast beaches of Costa Rica. The weather of this town is one of its greatest assets, and is an attractive characteristic for people looking to retire in Costa Rica. The roads are in good condition and getting to the Juan Santamaría International Airport can be easily achieved within 40 minutes. Most of the main crops cultivated in the area include corn, beans, and coffee. For several years one of the most lucrative activities of Puriscal was the production of tobacco and cigars. This activity has diminished during the last decade and is no longer economically significant. On the other hand, tourism has boomed recently, and several Puriscal hotels and restaurants have flourished within the last decade. One of Costa Rica’s most popular dishes is pork rinds, and Puriscal is known for having the best in the entire country, making it a quirky and popular tourist attraction for both national and foreign visitors. Generally speaking, land and housing is more affordable in Puriscal when compared to San Jose, its surrounding suburbs or other areas like Guanacaste. Still, prices in the area are increasing in direct proportion to the recent growth of this charming town.